There were 24 talented athletes announced in this year’s Berlin Marathon elite men’s field earlier this month, but most track fans stopped scrolling after three. After all, the ‘script’ of this race was clear: one of Eliud Kipchoge, Kenenisa Bekele, or Wilson Kipsang was going to win. And if any of them was to be challenged, the last one would be Kipchoge — the pre-race favorite who had run 2:00:25 in his most recent marathon, although the time was unofficial in terms of world records.So if we were to say that the only runner to challenge Kipchoge with less than 5K to go would be neither Bekele nor Kipsang, but the man listed No. 23 on the elite field list, most track pundits would have been skeptical to say the least. But that was precisely the reason that made Guye Adola’s 2:03:46 marathon debut record for second place in Berlin so special — and what could be an indicator of incredible things to come. To be fair, Adola didn’t come in to the race penniless — he won the world half marathon bronze medal three years ago, and his half marathon PR of 59:06 was (albeit marginally) faster than that of any of the “Big Three.” But as we’ve learned from Zersenay Tadese, a half-marathon ace doth not a great marathoner make, so the 26-year-old Adola was expected to go out conservatively in the second pace group for his first-ever marathon, possibly hoping to pick up the scraps for a fourth-place finish. But that didn’t stop Adola from abandoning conventional wisdom and crossing the half-marathon with group one at a suicidal pace of 61:30, right alongside the Big Three and Vincent Kipruto. Despite his untidy stride, he seemed comfortable, and his strength prevailed once Bekele and Kipruto fell off the pack early. The true moment of glory for Adola was just after 30K. When Kipsang walked off the course nauseous at the timing mat, the unthinkable had happened — all but one of the Big Three were out, and the marathon debutant was the only runner to remain with Kipchoge with just over 10K to go in the race. As we would soon learn, Adola wasn’t content to simply run with the best — he wanted to dethrone the best, so he made the boldest move in the race to create a two-second gap on Kipchoge with 5K to go. The move sent Twitter into a storm. The duel was on, and the odds seemed to be stacked against Adola; he ran like a beginner to the roads, drifting alongside Kipchoge rather than in front or behind him, and running wide of every turn despite several mid-race pointers from his competition. The timing of his late-race move will no doubt be questioned for weeks to come, but ultimately Adola had to settle for second in Berlin as Kipchoge played the patient game and drifted past Adola in the final miles. Though Adola came up just short of the win, he was rewarded with a shiny new 2:03:46 de-facto PR — a mark that would have been an outright PR for all but seven runners in history. Discounting Moses Mosop’s wind-aided Boston run from 2011, his time was also the fastest marathon debut in history, taking that title away from current marathon world-record holder Dennis Kimetto. He was brash, young, and his run was rife with tactical mistakes. But Guye Adola’s run in Berlin meant much more than his time or place — it could mean the coming of the world’s next great marathoner, and, yes, possibly even the world’s next marathon all-time record holder. 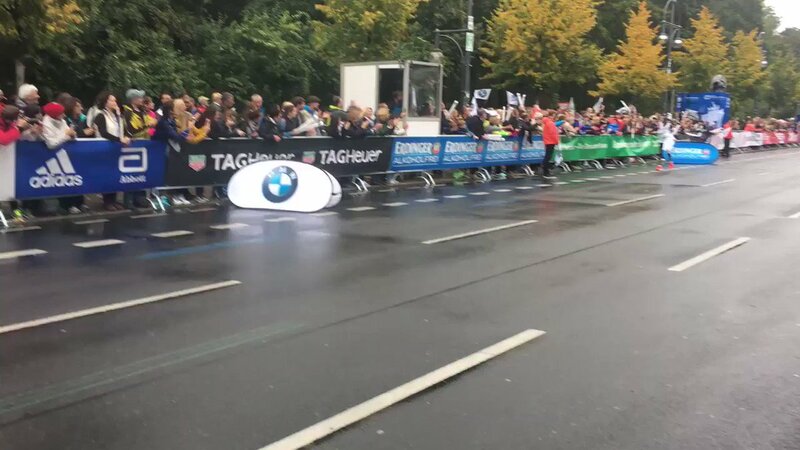 Eliud Kipchoge won the 2017 Berlin Marathon in 2:03:32, coming just short of his goal to break the world record of 2:02:57, set on the German capital course in 2014 by Dennis Kimetto, but outlasting one of the greatest marathon fields ever assembled to prove his status as the best in the world. Runner-up Guye Adola ran 2:03:46 in his debut marathon, the fastest time for a debutante and 10th-fastest time in world history, as top competitors Kenenisa Bekele and Wilson Kipsang dropped out and did not finish the race.